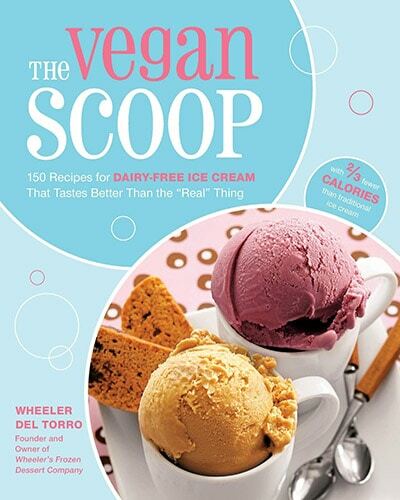 The Vegan Scoop brings the pleasures of the ice cream parlor into your home with 150 recipes for delicious frozen desserts that are rich and creamy. Developed by Wheeler del Torro of Wheeler’s Frozen Desserts, these “faux” creams feature 100 percent vegan-certified ingredients, making them suitable for both vegans and those with lactose intolerance. And with each serving containing approximately 80 calories—nearly 100 calories fewer than a serving of traditional ice cream—you can indulge with peace of mind. Chapters are devoted to innovative flavor “inspirations,” and cover everything from Caribbean & Island Flavors to Healthy Flavors and Aphrodisiacal Flavors. You’ll also find two chapters full of recipes for toppings, sauces, sides, and other dessert accompaniments. Wheeler del Torro is the founder and owner of Wheeler\u2019s Frozen Desserts, a microcreamery based in Boston that produces vegan ice cream using soy, coconut, rice and almond milks. Del Torro, who was born in Jamaica and moved to the U.S. as a teen, began the company in 2001, initially creating custom flavors for restaurants, companies, and high-end clientele. He opened his first store in Boston.